The battle is now on for Mosul, the so-called Islamic State's (ISIS/ISIL) biggest city. A grand coalition of Iraqi military, Shiite and Sunni militias, and Kurdistan's Peshmerga forces - with controversial help from the Turkish military - have now entered and mostly surrounded the city. See all this and more on the latest update to PolGeoNow's concise, professional map of control in Iraq's civil war, including a timeline of changes since our previous Iraq map report of September 2016. Want to see before you subscribe? Check out our most recent FREE SAMPLE Iraq map report! 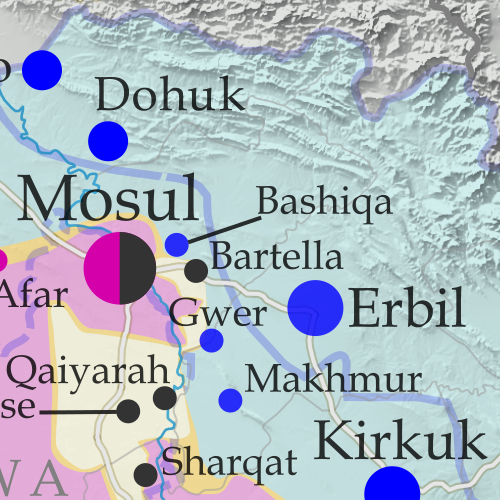 Up-to-date map of current territorial control in Iraq, color-coded for the Iraqi government, "Islamic State" (ISIS/ISIL) extremists, and Kurdistan's Peshmerga forces. Colorblind accessible.